Tropical rainforests contain four layers of vegetation. The emergent layer includes the tops of the tallest trees. The canopy layer is the main layer, forming an “umbrella” over the lower two layers. Below the canopy is the understory, where sunshine hardly penetrates, and most plants never grow taller than 12 feet. The forest floor is the lowest layer and hardly gets any sunlight. It’s hard for most plants to grow here, but some do. The plants that are able to survive in the low light conditions of the forest floor are adapted to warm, moist environments and, of course, very little sunlight. They include many types of mushrooms and other fungi. These darkness-loving plants live inside of dead and decomposing trees, branches and other rotting plant material. The forest floor is a rich environment, with a very thick layer of humus. When leaves, branches and fruit fall from the trees above they decompose quickly. The forest floor is also a habitat for many insects, such as ants; and animals, such as the giant anteater. Fungi help break down decaying plant material, which helps to make them useful to other plants as nutrients. Fungi don’t contain any chlorophyll, which is a green pigment that other plants use to transform sunlight into plant nutrients. Because they don’t produce their own food, they must live from the nutrients provided by the host plant on which they grow. Plants are very clever when it comes to their own survival and their production of more plants like themselves. For example, the strangler fig’s seeds drop onto the higher branches of canopy trees after birds and animals that have eaten them excrete them. High up in the canopy, the seeds sprout, sending long roots to the ground, where the developing tree gets water and nutrients. The fig then grows into a tree that blocks sunlight even from its host tree, and its roots encircle and later kill the host. 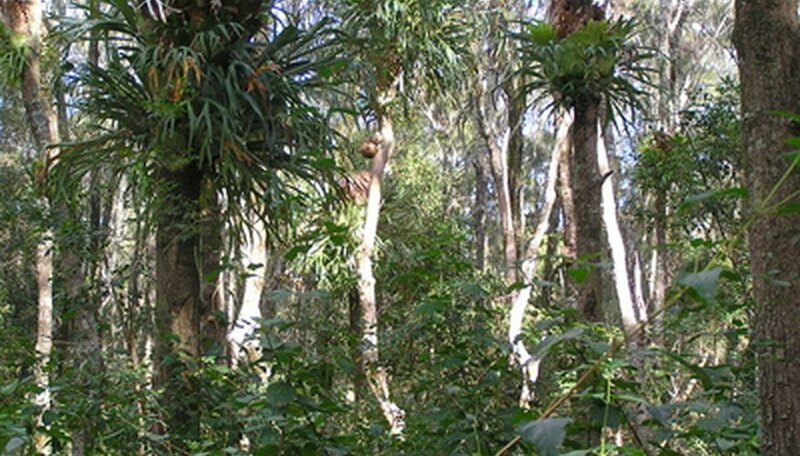 What Types of Soil Do Tropical Rain Forests Have?